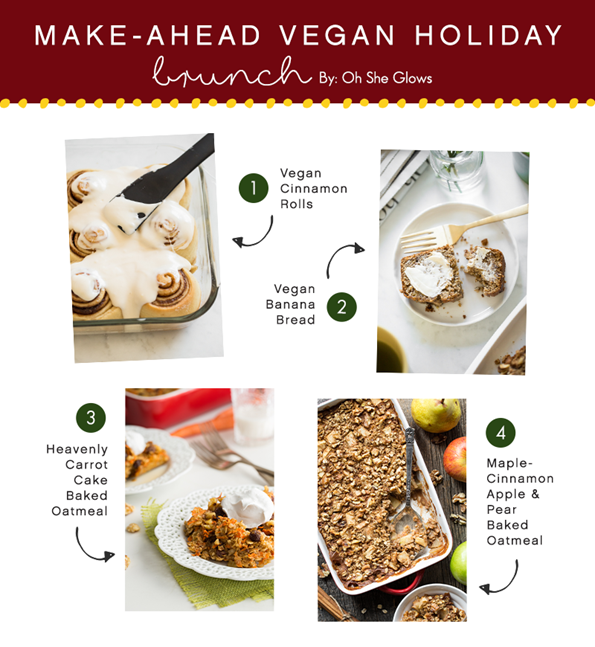 My make-ahead vegan holiday recipes plus handy tips! 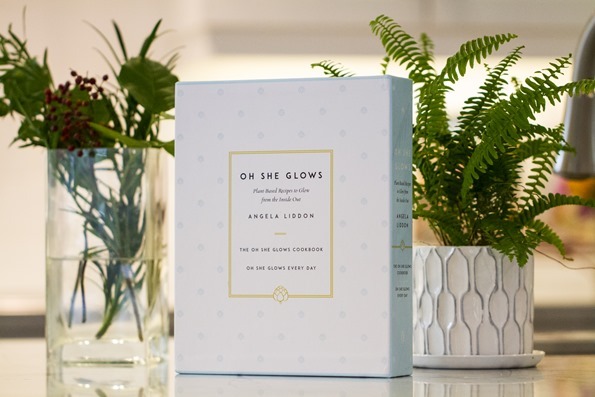 Before we dig into today’s juicy post, I want to share that, starting tomorrow (Nov. 23), the new Oh She Glows Boxed Set is 50% OFF! Whoa baby. The sale will continue until Tuesday, November 28th, so plenty of time to take advantage. Mine arrived last week, and I gotta say they’re b-e-a-utiful. A “glam shoot” soon followed, lol. Every morning while sipping my coffee, I respond to your questions and comments that have come in since the previous day. It’s one of my favourite relaxing morning rituals…right up until the kids realize “Mommy’s in the office!” and BUST THROUGH THE DOOR UNLEASHING TOTAL CHAOS. How do they always know? And how do I clean baby fingerprints off my camera lens? Anyway, I’ve been receiving a lot of holiday meal prep questions, and while I always try to troubleshoot your questions immediately, I’m often left needing some time to try out my ideas. 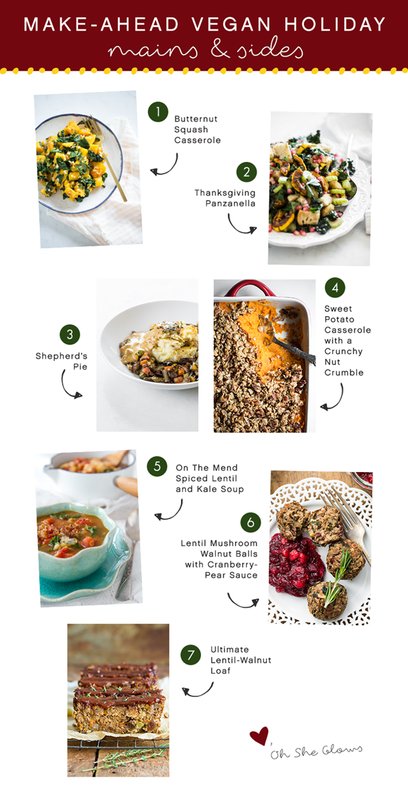 So, this month my recipe tester Nicole and I have been busy tackling make-ahead versions of my most popular holiday recipes! Last year, Eric and I hosted two big holiday meals while juggling a newborn and toddler (we didn’t want to travel so everyone came to us which was so nice), and looking back I REALLY could’ve used these tricks and tips then. I felt pretty frazzled. Oh well, I’m here today to help take some of the guesswork out of your preparations—from mains and sides to breakfast and dessert recipes too. Even if you walk away today with one new idea or trick up your sleeve I’ll consider it a holiday WIN. I realize this post is probably too late for American Thanksgiving tomorrow, but for those of you who cook holiday spreads in December like we do, I hope it’ll be helpful. Oh and please feel free to share your tips and tricks because the more the merrier when it comes to simplifying this time of the year. Do you have a game plan? Are you being treated to a meal or are you hosting this year? Be sure to let me know if you have any lingering questions. I’ll try my best to help. I’d like to wish my American readers a fun, safe, and delicious Thanksgiving! 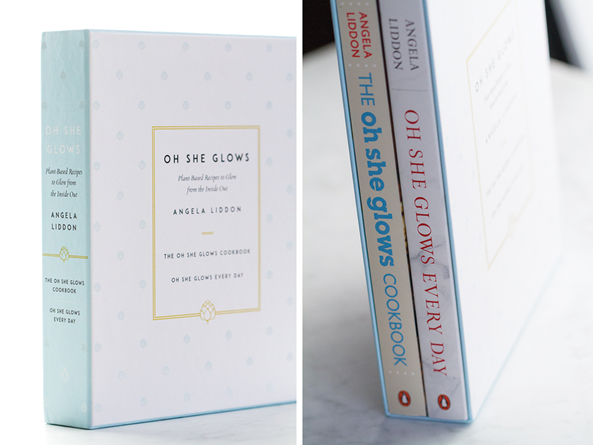 If you make any OSG recipes, please tag your photos with #ohsheglows and @ohsheglows. I’d love to see them! Cheers, friends. Prepare entire casserole (do not bake it yet). Wrap the unbaked casserole and place in the fridge for up to 2 days. Remove casserole from fridge and unwrap, setting it aside while the oven preheats. Bake as directed. Follow recipe directions which include detailed make-ahead instructions. Prepare entire casserole as directed, but do not bake. Wrap the unbaked casserole and place in the fridge one day before you intend to serve it. Day-of, remove wrap, sit casserole on the counter while the oven preheats, and bake as directed. Prepare entire casserole (do not bake it yet). 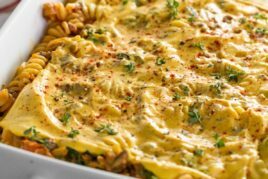 Wrap up the unbaked casserole and place in the fridge for up to three days. Remove wrap, sit casserole on the counter while the oven preheats, and bake as directed. Cook the soup as directed. Pour into freezer-safe containers leaving an inch for expansion. 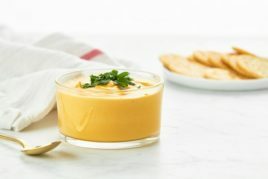 Cool the soup, secure lid, and freeze up to one month before serving. Thaw in the fridge or at room temperature and transfer to a pot. Reheat on the stovetop over medium heat. Cranberry-Pear Sauce: Cook the cranberry sauce as directed. Cool and transfer to a freezer-safe container. Freeze one to two 1 to 2 weeks before. Thaw overnight in the fridge. Lentil Mushroom Walnut Balls: Prepare the lentil balls (do not bake yet), and place the unbaked balls on a plate. Wrap the plate and refrigerate for 1 to 2 days. Remove wrap and place on a lined baking sheet. Bake as directed. Prepare the loaf as directed (do not bake yet). Cover the loaf pan with wrap and refrigerate for 2 to 3 days. Uncover, sit pan on the counter while the oven preheats, and bake as directed (you’ll likely need closer to 60 minutes since it’s baking straight from the fridge). For the frosting: Prepare frosting as directed and place in an airtight container before refrigerating 3 to 5 days in advance. For the rolls: Simply follow the recipe until you complete the second rise. Place the wrapped dish in the fridge overnight. In the morning, remove the dish from the fridge, flick on your oven light, and let the rolls sit in the unheated oven with the light on for about 20 minutes. After that, remove the dish from the oven and preheat to 350°F (180°C). Remove the plastic wrap and bake as directed. Prepare and bake the loaf as directed. Cool it on a cooling rack, and then wrap it tightly with plastic wrap, followed by a layer of tinfoil. Alternatively, place the cooled loaf into a large freezer bag with the air sucked out. Freeze. Thaw in the fridge overnight. Prepare the oatmeal (do not bake yet), wrap up the dish, and refrigerate for up to 24 hours. In the morning, unwrap, sit casserole on the counter while the oven preheats, and bake as directed. Serve with Coconut Whipped Cream (make-ahead option below). Prepare the oatmeal (do not bake yet), wrap the dish, and refrigerate for up to 24 hours. In the morning, unwrap and set dish on the counter while the oven preheats. Bake as directed. Serve with Coconut Whipped Cream (make-ahead option below). Prepare the torte as directed (hold off on the Coconut Whipped Cream until serving). Freeze as directed, 1 to 2 weeks in advance. Let it sit at room temperature for 10 to 20 minutes before slicing. Serve with Coconut Whipped Cream. Prepare the entire pie as directed. Freeze as directed, 1 to 2 weeks in advance. Let it sit at room temperature for 10 to 20 minutes before slicing. Serve with Coconut Whipped Cream. Tip: for a nut-free version, make my Mini Pumpkin Pie Tarts with a Sunflower Cookie Crust. Freezing: Prepare the coconut whipped cream as directed. Transfer to a freezer-safe bag and press out the air. Seal the bag and freeze for 1 to 2 weeks. Thaw overnight in the fridge, and whip with a whisk before using, if needed. Refrigerating: Prepare the coconut whipped cream as directed. Transfer to a dish and cover. Refrigerate for up to a couple days before using. Whip with a whisk before using, if needed. Make the dough. Shape balls of dough and roll in turbinado sugar. Place unbaked balls into a freezer-safe bag, seal, and freeze. If baking balls from frozen, add an extra 3 to 4 minutes to baking time. Or you can thaw the balls at room temperature for 30 to 60 minutes day-of and bake as directed. 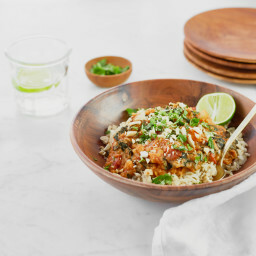 Cheesy Lentil Bolognese Casserole + Celebrating 9 years!! Thanks Taylor..I hope it helps! These look great! I may have to try a few of these! Can’t wait to try some of these recipes. Maybe this is a dumb question, but is the Canadian version of the book different than American? ie: grams versus cups etc? Not a dumb question at all Amanda, I get it a lot! The two versions are the exact same except for the cover. Thanks for clarifying! Hi Lisa, Oh I’m so sorry to hear that! I think the high fee is due to customs/duty (as Indigo is a Canadian company) plus shipping a heavy box. Same here. Had asked my aunt to buy it for me as a Christmas present, but shipping to Mexico is $60. Sorry, but that can’t be right. Will the set be available on Amazon anytime soon? And adding another question to this: I know your books have also been translated into German. How much do they differ from the original version in English? Hi Gesa, As far as I’m aware the translation should be the same as the original books and there shouldn’t be any major differences. Hi Gesa, Aw thank you for considering this as a Christmas present…I’m so flattered. And so sorry to hear about the high shipping price! It’s coming from Canada so Indigo has duty and customs fees as well as shipping to cover a heavy box. Unfortunately it is only sold at Indigo and won’t be on Amazon for sale. * oops is the best! 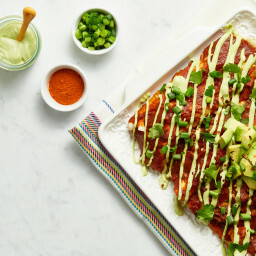 Excellent idea with all of these make-ahead dishes! 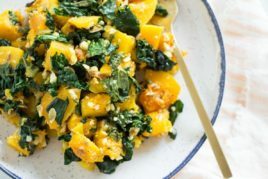 I’ve found that make-ahead dishes are really a great way to make holidays less stressful, while making it easier to stick to your health goals. They also allow more time to spend catching up with friends and family. After all, that’s what the holidays are all about! Hi Kamila, I’m so sorry to hear that. The boxed set ships from Canadian company, Indigo, so there are customs/duty fees as well as shipping for a heavy box. Thanks for your interest in the set, anyway! 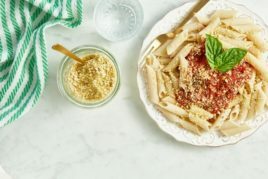 Am I crazy or are you missing a recipe on your site/app? I was looking for the almond ‘healthy no sugar’ cookie recipe… you shaped them like little gingerbread men in your photo. I was using it for my daughters afternoon snack. I’m sooo bummed it’s gone! Can you help? I have two gingerbread man type cookies in the app: Healthy Kiddo Cookies and Gingerbread Cut-Out Cookies (found in the Cookie Lover’s Bundle on the bundle page). I would suggest making sure your free cookie lover’s bundle has been downloaded. :) Please let me know if this helps! Okay Angela, I figured it out! So, on the app, if select to search by category then the healthy kiddo cookie disappears. However, if you just use the chronological search then it’s there. Does this make sense? Thanks for your reply. I was losing my mind trying to figure this out!! Ha. Hey Crystalyn, Thanks so much for the cookbook love. So happy you love the look of it as much as I do. I’ll be sure to announce if there is another 50% off sale. I know currently it’s 30% off! Such a cool idea for the holidays! Hi Angela, for the Chocolate-Espresso Torte, do you need to remove the skins from the hazelnuts? I’ve had both of your cookbooks since I became vegan 3 years ago and I couldn’t live without them, but I’ve never tried this torte recipe, so I thought I would make it for the holidays this year. Thanks! Hey Rebecca, Happily, you don’t have to remove the skins for this crust. :) I hope you love it if you try it out this year. Happy holidays! 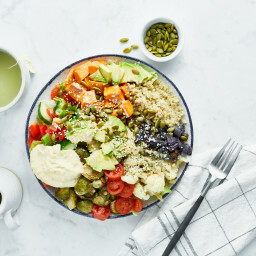 Can I substitute sesame seeds and tahnini for sunflower seeds? Hi Catherine, I’m wondering if this comment was supposed to be on another post? :) Please let me know which recipe and I’ll see if I can help! I love this post!! I can’t wait to make some of these recipes. Last night to go with dinner I made the best ever kale salad from your newest cookbook. I don’t know what it is about that salad, but it is addicting!! Hey Lori, Im so happy you love the post…thanks! I can’t see why oat flour and almond flour wouldn’t work! I just am not sure of the exact amounts. If I was going to try it out, I would probably use 3/4 cup oat flour and 3/4 cup almond flour…but just guessing! You kind of need to eyeball the dough as you go to make sure it’s not too wet or too dry. If you try anything out please let me know how it goes! Thanks so much for your reply! I am craving a good molasses cookie, so I’m going to give it a try! Thanks! I made the molasses ginger cookies with almond flour and oat flour. They turned out really good! I think I added a bit too much flour because they are a tiny bit dry. But I bet if I baked them for less time that would probably take care of it. I added chocolate chips to the batter and it was amazing!! They were definitely good enough to make again, I’ll just make a note to bake for less time. Hey Lori, Thanks for letting me know! I’m glad the first attempt was good enough to try again. :) How much of each flour did you use? I was excited to find this post. I remember when you introduced Thanksgiving Panzanella and wanted to find it today, but couldn’t remember the name. Voila! Here it is Thank you and Nicole for your time and care putting this together. 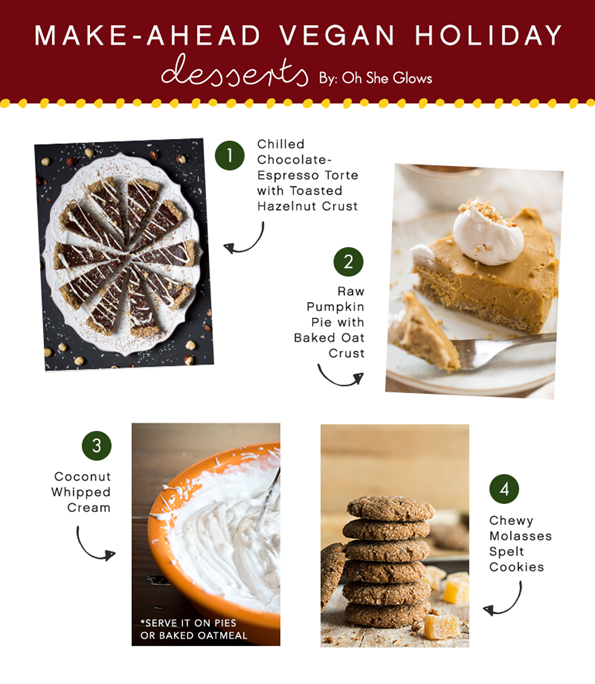 All the recipes certainly look holiday worthy! Hey Margaret, I’m so glad you found it! I hope you love it as much as we do. I ended up not making the Panzanella (yet! ), but your lentil walnut loaf and sweet potato casserole were delicious for our Christmas dinner. For some reason, I was moved to mix the pecan crunch topping into the potatoes before baking, and topped with only the marshmallows, but it still turned out great, I think. Thank you for these two vegan holiday staples! Cassie, that’s such a good idea! After thawing, does she reheat it in the oven? I’m so glad this list will be helpful for you around the holidays. Congrats on your little bundle of joy! Yes, reheated in the oven prrtty much the same as the usual recipe. I’m looking forward to indulging tomorrow! That’s so great! I will try that as I have never made it that far ahead. Such a good idea. Just wanted to thank you for this post! I have company coming and wanted to prepare some special foods ahead of time. Right now I have two chocolate tortes, a triple (!) batch of lentil balls and the sauces for the lentil bolognese in my freezer (I’ll boil the pasta and bake on the day I serve them). Just having these things prepared is making me so much more relaxed and excited for my company to come! Hey Mara, Nice work on all that prep! Im so happy to hear that this post has been helpful for you. It makes such a difference to have some food prepared before company arrives, doesn’t it? I’ll be doing the same this week. Have a wonderful holiday! I want to make so many of your recipes, but I am allergic to almonds. Do you have any suggestions of alternatives in your cinnamon rolls and cookies? Hey Elizabeth, happy to help! :) You can swap the almond milk in the cinnamon buns for another milk that you enjoy. As for the cookies, do you have any specific ones in mind and I can try to help offer swaps if I know of any. So glad to hear you’re making so many recipes by the way! Previous post: Cheesy Lentil Bolognese Casserole + Celebrating 9 years! !